Large and small pieces, mainly rectangles and mainly cottons, machine sewn. One side has replacement materials in red check, brown, tan, blue and pink materials. The padding is an old woollen blanket. 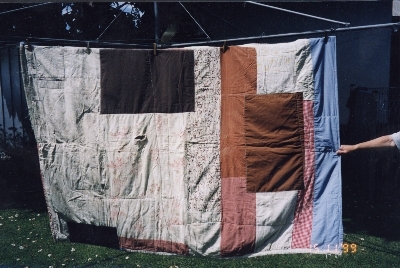 The quilt was made by Mrs. Mary McGregor possiblky at Bulla, Victoria pre 1951. It was then owned by Florence McGregor and now by Joan McGregor. It is used as a throw over on a couch. Mary McGregor was born and married in Scotland and came to Australia with her husband and 3 children on the ship 'Geelong' in 1914. Little is known of their early life in Australia but it is known they lived at 'Glenara' Bulla Vic where Mary's husband was a gatekeeper and part time gardener. Mary died in 1951. Crazy patchwork quilt with patches of velvet, satin and silk joined in 12 blocks. Each seam is embroidered and many patches have embroidered flowers. There is a 140mm maroon velvet border. The backing is maroon silk. There is a sachet that belongs with the quilt. Double bed patchwork coverlet of pieced blocks in a pinwheel or dresden plate pattern of prints on a cream ground, each block with a 1 3/4" border or sash. Each pinwheel has 10 pieces, and the quilt is constructed 8 blocks by 6. Cotton fabrics are in florals, checks and stripes, in blues, greens browns, pinks, purple. 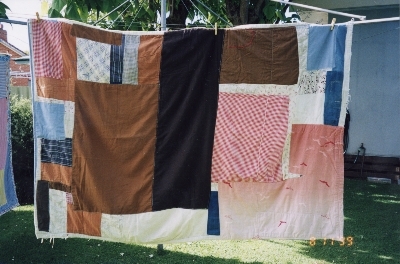 The quilt was in poor repair and has been reduced in size. Conservation work has been done by the State Conservation Centre. The quilt is a repeat block in the Ohio Star pattern in turkey red and cream. Quilted in squares in the cream block and diagonal lines in the star block. The fabric border is disintegrating. The backing is cream calico and the padding is cotton, badly degraded. 1940 x 1760mm.